"Turn the Page" is a song originally released by Bob Seger in 1973 on his Back in '72 album. Though never released as a single, Seger's live version of the song on the 1976 Live Bullet album became a mainstay of album-oriented rock radio stations, and still gets significant airplay to this day on classic rock stations. Robert Clark Seger is an American singer-songwriter, guitarist and pianist. As a locally successful Detroit-area artist, he performed and recorded as Bob Seger and the Last Heard and Bob Seger System throughout the 1960s, breaking through with his first national hit and album in 1968. By the early 1970s, he had dropped the 'System' from his recordings and continued to strive for broader success with various other bands. In 1973, he put together the Silver Bullet Band, with a group of Detroit-area musicians, with whom he became most successful on the national level with the album Live Bullet (1976), recorded live with the Silver Bullet Band in 1975 at Cobo Hall in Detroit, Michigan. In 1976, he achieved a national breakout with the studio album Night Moves. On his studio albums, he also worked extensively with the Alabama-based Muscle Shoals Rhythm Section, which appeared on several of Seger's best-selling singles and albums. Back in '72 is the sixth studio album by American rock singer-songwriter Bob Seger, released in 1973. It was the first new album on Seger's label, Palladium Records, to be released under their distribution deal with the Reprise division of Warner Bros. Records and one of several early Seger albums that has never been reissued on CD. ‘Live’ Bullet is a live album by American rock band Bob Seger & the Silver Bullet Band, released in April 1976. It was recorded at Cobo Hall in Detroit, Michigan, during the heyday of that arena's time as an important rock concert venue. The album is credited, along with Night Moves, with launching Seger's mainstream popularity. Teegarden & Van Winkle were an American musical duo, composed of Skip (Knape) Van Winkle, and David Teegarden. Formed in Tulsa, they took their folksy rock to Detroit. The Midwestern United States, also referred to as the American Midwest, Middle West, or simply the Midwest, is one of four census regions of the United States Census Bureau. It occupies the northern central part of the United States. It was officially named the North Central Region by the Census Bureau until 1984. 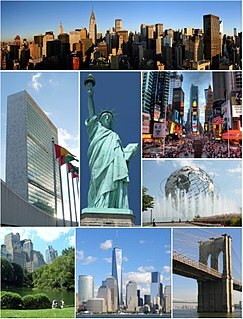 It is located between the Northeastern United States and the Western United States, with Canada to its north and the Southern United States to its south. The Mellotron is an electro-mechanical, polyphonic tape replay keyboard originally developed and built in Birmingham, England, in 1963. It evolved from a similar instrument, the Chamberlin, but could be mass-produced more effectively. The instrument is played by pressing its keys, each of which presses a length of magnetic tape against a capstan, drawing it across a playback head. Then as the key is released, the tape is retracted by a spring to its initial position. Different portions of the tape can be played to access different sounds. Alto Reed is an American saxophonist best known as a long-time member of Bob Seger and the Silver Bullet Band. Jonathan James "Jon" English was an English-born Australian singer, songwriter, musician and actor. He emigrated from England to Australia with his parents in 1961. He was an early vocalist and rhythm guitarist for Sebastian Hardie but left to take on the role of Judas Iscariot in the Australian version of the stage musical Jesus Christ Superstar from May 1972, which was broadcast on television. English was also a noted solo singer; his Australian top twenty hit singles include "Turn the Page", "Hollywood Seven", "Words are Not Enough", "Six Ribbons" and "Hot Town". It's All a Game is the second studio album by Australian musician, Jon English. The album was released in Australia November 1974. The album produced English's first top twenty single, a cover of Bob Seger's "Turn the Page" which entered the Kent Music chart in February 1975. The song peaked at number 7 in New Zealand. The Kent Music Report was a weekly record chart of Australian music singles and albums which was compiled by music enthusiast David Kent from May 1974 through to 1988. After 1988, the Australian Recording Industry Association, which had been using the report under licence for a number of years, chose to produce their own listing as the ARIA Charts. from the album Garage Inc.
"Bleeding Me"/"Stone Cold Crazy"/"The Wait"
(1998) "Whiskey in the Jar"
Bon Jovi is an American rock band formed in 1983 in Sayreville, New Jersey. It consists of singer Jon Bon Jovi, keyboardist David Bryan, drummer Tico Torres, guitarist Phil X, and bassist Hugh McDonald. Previous bassist Alec John Such was dismissed in 1994, and longtime guitarist and co-songwriter Richie Sambora left in 2013. Slippery When Wet is the third studio album by American rock band Bon Jovi. It was released on August 18, 1986 by Mercury Records in North America and Vertigo Records internationally. The album was produced by Bruce Fairbairn. Recording sessions took place between January and July 1986 at Little Mountain Sound Studios in Vancouver, British Columbia, Canada. Smokin' O.P. 's is the fifth studio album by American rock singer-songwriter Bob Seger, released in 1972. The album was reissued on CD by Capitol Records in 2005. It is currently the earliest Bob Seger album available on CD. The cover art is a parody of the Lucky Strike cigarette logo. Smokin' O.P. 's refers to Smokin' Other People's Songs, a derivation on the slang phrase "Smoking O.P. 's" meaning to smoke other people's cigarettes exclusively. Most of the tracks on this release are covers of songs written by other artists. Seven is the seventh studio album by American rock singer-songwriter Bob Seger, released in 1974. It is currently out of print. Nine Tonight is a live album by American rock band Bob Seger & The Silver Bullet Band, released in 1981. The album was recorded at Cobo Hall in Detroit, Michigan, in June 1980 and at the Boston Garden in Boston, Massachusetts in October 1980. With the exception of three tracks - "Nine Tonight", "Tryin' To Live My Life Without You" and "Let It Rock" - the album is composed entirely of songs drawn from Seger's three previous studio albums. Only "Let It Rock" was repeated from the previous live album Live Bullet. "Tryin' to Live My Life Without You" was a U.S. top 5 pop hit, peaking at #5. The album's title track was originally recorded for the Urban Cowboy soundtrack album. Like a Rock is the thirteenth studio album by American singer-songwriter Bob Seger, released in 1986. The title track is best known for being featured in Chevrolet truck commercials throughout the 1990s and early 2000s. "Fortunate Son" is a live cover of the 1969 Creedence Clearwater Revival hit, recorded March 31, 1983 at Cobo Hall in Detroit. It was originally available only as the B-side of the "American Storm" single, and was added as a bonus track to the CD release of the album. The vinyl version ends with "Somewhere Tonight". The song "Miami" is featured in an episode of the TV series Miami Vice. This is the first studio album credited to "Bob Seger & the Silver Bullet Band" that doesn't feature the Muscle Shoals Rhythm Section replacing the Silver Bullet Band on any tracks. Greatest Hits is a compilation album by Bob Seger & the Silver Bullet Band, released in 1994. Certified Diamond by the RIAA, it is Seger's most successful album to date. In December 2009, Billboard and Nielsen SoundScan confirmed that with nearly nine million copies sold, Bob Seger's Greatest Hits was the decade's best-selling catalog album in the United States, even out-selling The Beatles' 1 and Michael Jackson's Number Ones. By September 2011, the album had sold a total of 9,062,000 copies in the United States. 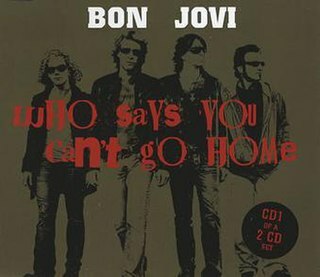 "Who Says You Can't Go Home" is a song written by Jon Bon Jovi and Richie Sambora for the American rock band Bon Jovi's ninth album Have a Nice Day (2005). The song was produced by John Shanks, Jon Bon Jovi and Richie Sambora. It was released as the second single in North America in the first quarter of 2006 and reached the top 30 on the U.S. Billboard Hot 100 singles chart, peaking at #23. Outside North America, "Welcome to Wherever You Are" was released as the second single with "Who Says You Can't Go Home" being released as the album's third release on June 12, 2006. The song reached #5 in the UK, becoming the band's second Top 10 single from the album. A version of the song was also shipped to country music radio, featuring duet vocals from Jennifer Nettles of the duo Sugarland and peaked at #1 on the Country charts. 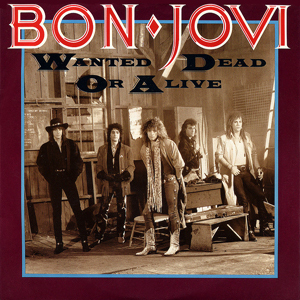 "Wanted Dead or Alive" is a song by American rock band Bon Jovi. It is from their 1986 album Slippery When Wet. The song was written by Jon Bon Jovi and Richie Sambora and was released in 1987 as the album's third single. During a February 20, 2008 encore performance in Detroit, Jon Bon Jovi told the crowd about running into Bob Seger at a Pistons game. As he introduced his song "Wanted Dead or Alive", he said it was inspired by Seger's "Turn the Page" hit and called the song the band's anthem. The song peaked at #7 on the Billboard Hot 100 chart and #13 on the Mainstream Rock Tracks chart, making it the third single from the album to reach the Top 10 of the Hot 100. As a result, Slippery When Wet was the first hard rock/glam metal album to have 3 top 10 hits on the Billboard Hot 100. "Whole Lot of Leavin'" is a song by American rock band Bon Jovi. It was written by Jon Bon Jovi and John Shanks and it was released only in Europe as the fourth single from the band's album Lost Highway and charted at #22 in Austria and #41 in Germany. "Till We Ain't Strangers Anymore" is a song by American rock band Bon Jovi, from their tenth studio album, Lost Highway, released in 2007. The song was released by Mercury Nashville to radio in the United States, and as a CD Maxi in Germany, Switzerland and Austria in November 2007 as the album's third single. It features country pop singer LeAnn Rimes, and also appears as a bonus track on her 12th album, Family. David Teegarden is a member of the 1960s and 1970s psych-rock group Teegarden & Van Winkle. He is a resident of Tulsa, Oklahoma. Teegarden has worked with many musicians including J. J. Cale, Eric Clapton, Joe Walsh, and Bob Seger. In 1981, Teegarden won a Grammy for Best Rock Performance by a Duo or Group with Vocal for Against the Wind with Bob Seger & the Silver Bullet Band. Early Seger Vol. 1 is a compilation album by American rock singer–songwriter Bob Seger, released in 2009. The album, which includes archival material from the 1970s and 1980s, was released exclusively to Meijer stores on November 24, 2009. Since November 30, 2009 it has also been available for purchase at BobSeger.com, both on CD and as a digital download. Eventually Early Seger Vol. 1 became available at Amazon.com on February 1, 2010. "Gets Ya Pumpin" and "Midnight Rider" are the first two singles from the album. Ultimate Hits: Rock and Roll Never Forgets is a compilation album by American rock singer–songwriter Bob Seger. The double-disc album was released on November 21, 2011 and contains 26 remastered tracks from throughout Seger's career, which spans more than four decades. Included are the original mono version of "Ramblin' Gamblin' Man", Seger's first hit with The Bob Seger System from 1968, the classic Christmas song "The Little Drummer Boy" from 1987's A Very Special Christmas, which makes its first appearance on a Seger album, and previously unreleased cover versions of Tom Waits' "Downtown Train" and Little Richard's "Hey, Hey, Hey, Hey ." There is also a Walmart exclusive edition that includes the bonus track "Living Inside My Heart," a song from the soundtrack of the 1986 film About Last Night..., which has also never before been released on any Bob Seger album. Two songs on this compilation album are edited compared to the original releases: "We've Got Tonight" is the single edit, which is about one minute shorter than the album version, and "Katmandu" is a newly edited version which omits the second verse, making the song also about one minute shorter compared to the original album version. In the US it was certified gold and platinum in June 2013 by the RIAA. Ride Out is the seventeenth studio album by American rock singer–songwriter Bob Seger. The album was released on October 14, 2014. Although Seger had previously stated that this may be his final album, a follow-up album entitled I Knew You When was released on November 17, 2017. Radio Free America is the debut studio album released by RSO, featuring ex-Bon Jovi guitarist Richie Sambora and Australian guitarist Orianthi. The album was released May 11, 2018. ↑ Brian McCollum (March 14, 2004). "A definitive oral history of Seger's early years". Detroit Free Press. 1 2 Weschler, Tom, and Gary Graff. Travelin Man: on the road and behind the scenes with Bob Seger. Detroit, Michigan: Wayne State University Press, 2009. ↑ Kent, David (1993). Australian Chart Book 1970–1992 . St Ives, NSW: Australian Chart Book. ISBN 0-646-11917-6. ↑ Armstrong, Chuck. "Metallica, 'Turn the Page' – Official Music Video". Ultimate Metallica. Retrieved December 14, 2013. ↑ "2015 CMT Music Awards: The Winners". CMT.com. June 11, 2015. "2 + 2 = ?" "Rock and Roll Never Forgets"
"Tryin' to Live My Life Without You"
"Hey, Hey, Hey, Hey (Going Back to Birmingham)"